How many men from the Einsatzgruppen and other forces were available to murder Jews in the East? There were not enough active members in the four Einsatzgruppen and other forces to murder 1,150,000 Jews in the East. How could these small bands of men have had the time and ability to find, gather, and murder millions of Jews? The Einsatzgruppen units did not murder 1,150,000 Jews by themselves. Beyond the four Einsatzgruppen units, there were German police battalions, local auxiliary units, and SS brigades assigned to support them. From the start, they had 36,000 men available if needed. The Wehrmacht (regular German army) also provided support and material, sometimes participating in the executions themselves. Further, the local population also murdered Jews in pogroms. They were incited by the Einsatzgruppen in the early days of the war and later were organized into formal units, which aided the Einsatzgruppen in the murder of the Jews. Tens of thousands of additional troops and their equipment were available for use by the Einsatzgruppen. They only needed to request this support. The Wehrmacht (regular German army) also cooperated closely with the Einsatzgruppen and, at times, regular Nazi soldiers participated in the executions. 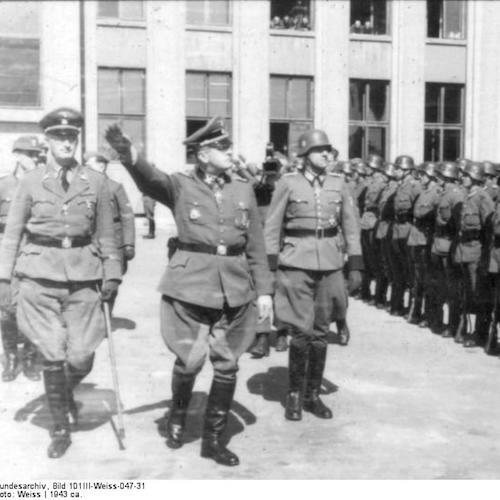 These Wehrmacht soldiers did not just guard the Jews and maintain order, as Bishop states. Rather, they actively committed the murders themselves. Among the men the Einsatzgruppen could draw on were 11 Orpo [Order Police] battalions—some 17,000 men in total. They also had access to SS Brigades 1 and 2, an SS cavalry brigade, and auxiliary Nazi police units from the Higher SS Police Leaders—some 19,000 men in total. In addition, the Einsatzgruppen could requisition trucks and other necessary material upon request from the Wehrmacht and civil or military occupation authorities. The photographer’s images show the pogrom in progress, including Lithuanian men with raised clubs standing amidst the bodies of the Jews. The crowd of local Lithuanians and German soldiers stood around the edges of the photo cheering them on. When the desire of locals to conduct bloody pogroms petered out, the Einsatzgruppen organized the local populations into formal units. These units were under the Einsatzgruppen’s direct control and they supervised the local populace in their mass executions of Jews. By Bundesarchiv, Bild 101III-Weiss-047-31 / Weiss / CC-BY-SA 3.0, CC BY-SA 3.0 de, via Wikimedia Commons. Holocaust deniers’ assertion, that the Einsatzgruppen were “tiny bands” of men who could not possibly have murdered 1,150,000 Jews by themselves, is false and misleading. First, between the four Einsatzgruppen units and the resources they could marshal, there was more than enough available manpower to murder some 1,150,000 Jews in the occupied Soviet territories. Nazi police battalions, local auxiliary units, and SS brigades were assigned to support the Einsatzgruppen as needed. From the start, the Einsatzgruppen had 36,000 men available. The Wehrmacht provided support and material, requested “cleansing” operations, and participated in the executions themselves. In the early days of the war, the local population also murdered Jews in pogroms incited by the Einsatzgruppen. Later, these willing volunteers were organized into formal units under the four Einsatzgruppen’s control. Joseph Bishop, “The Einsatzgruppen and the Holocaust,” Inconvenient History, V1(3), 2009 at http://inconvenienthistory.com/archive/2009/volume_1/number_3/einsatzgruppen_and_the_holocaust.php. Peter Longerich, Holocaust: The Nazi Persecution and Murder of the Jews (Oxford University Press, 2010), pp. 244-247. Yitzhak Arad, The Holocaust in the Soviet Union (University of Nebraska Press and Yad Vashem, 2009), pp. 58-59. Heinz Peter Longerich, The Systematic Character of the National Socialist Policy for the Extermination of the Jews (“A. Orders”) at https://www.hdot.org. Ernst Klee, Willi Dressen, and Volker Reiss (editors), “The Good Old Days”: The Holocaust as Seen by Its Perpetrators and Bystanders (Free Press, 1988), p. 24. Ernst Klee, Willi Dressen, and Volker Reiss (editors), “The Good Old Days”: The Holocaust as Seen by Its Perpetrators and Bystanders (Free Press, 1988), pp. 32-33. Ernst Klee, Willi Dressen, and Volker Reiss (editors), “The Good Old Days”: The Holocaust as Seen by Its Perpetrators and Bystanders (Free Press, 1988), pp. 31-32. Ernst Klee, Willi Dressen, and Volker Reiss (editors), “The Good Old Days”: The Holocaust as Seen by Its Perpetrators and Bystanders (Free Press, 1988), pp. 26, 30.